Everything You Want to Know About Tree Bark | Mr. Tree, Inc.
Do Tree Rings Really Indicate Age? You’ve noticed bark falling off a tree on your property. You don’t want to risk losing a tree that provides many benefits to your landscape and outdoor lifestyle. What should you do? First of all, don’t panic. There are many reasons for that loose bark you see at the base of your tree, and they aren’t all bad. In fact, some are perfectly natural, or at least due to nature. And, those that do indicate problems can usually be remedied. 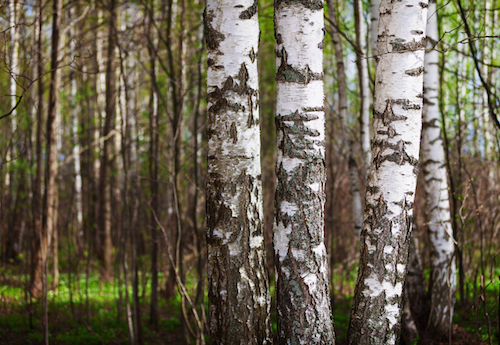 Tree bark is essentially the outermost, dead layers of cambium—the living tissue of trees that transport minerals up from the roots throughout the tree. The bark serves an important function in the health of the tree. Just like our own skin, tree bark protects the inner layers of the growing tree from the elements. It also provides a barrier against insects and disease. But your trees are more than a living example of nature and science. Your trees are an investment. Whether you’ve selected them for your landscape or they grew there naturally, trees add to the aesthetic beauty and value of your property. More than that, they play many important roles both in our ecosystem and landscaping. Of course trees absorb carbon dioxide, carbon monoxide, and other gases, and then release oxygen into the air—one large tree can supply a day’s oxygen for up to four people. Trees also reduce water runoff and prevent soil erosion. Good reasons for doing all you can to keep your trees healthy. Deciduous (leaf bearing) trees reduce air temperature in the summer by blocking sunlight. In winter, the sun’s warming rays pass through the bare branches. This can greatly assist in the cooling and heating of buildings, as well as regulating the air temperature in your outdoor spaces. Both deciduous and evergreen trees create microclimates suitable for shade-loving plants and provide important barriers to wind and noise. Trees fulfill all of these roles, whether in nature or a designed landscape. After nurturing the healthy growth of the trees in your landscape, you don’t want to take the chance of losing even one. Your first step, if bark is falling off trees on your property, is to determine what the possible cause might be. Below are the most common reasons for bark loss. Trees grow from the inside out by forming layers of fibrous tissue. This causes the outer layers to expand—the older a tree is, the less flexibility in the bark. With the loss of elasticity, the bark will crack and split and eventually fall away from the trunk. For this reason, you will always see a certain amount of bark falling off trees throughout the growth cycle. In some species, such as birch trees, this natural shedding presents as peeling of the outer layer. Wind, animals, and simply time will cause the old bark to fall away from the tree. A sudden, heavy frost can sometimes result in bark falling off trees, especially on the south or southwest facing side of the trunk. Sudden, or great fluctuation in temperature can cause cracks in the bark, and eventually it falls off. Likewise, sudden, extreme heat can cause similar damage and bark falling from trees. Weather stressed trees will benefit from some tender loving care. Mulch around the base of the tree and provide plenty of water to hydrate the tree when the soil is dry. Be sure to use a quality, organic mulch and refresh it in the spring and fall. Many species of animals can and will strip bark from trees for various reasons. Sometimes, this behavior is weather related, such as looking for moisture during a drought, or to dig out a tasty meal of burrowing insects and larva. Squirrels can be especially bothersome, exposing large surface areas of a tree’s inner layers, leaving chunks of bark on the ground. Others animals known for stripping bark include bears, rabbits, field mice, and voles. On an otherwise healthy tree, limited bark stripping by animals doesn’t pose a significant threat to the tree, however, the exposed layers are susceptible to insect and fungus invasion. In some cases, when the bark is stripped entirely around a branch, it should be removed. If you suspect animal damage is responsible for stripping and bark falling from trees in your landscape, Mr. Tree can help remedy the problem with the use of protective barriers and, if necessary, professional pruning. Bark falling off a tree can sometimes be an indication of fungus just beneath the outermost layer. Small bits and larger pieces of dead and already decomposing bark will break off and collect at the base of the tree. Black, brown, or red colored lesions on the trunk and branches of trees (cankers), penetrate the bark. They will cause disfigurations and branch dieback if left untreated. Cankers may eventually kill a tree. Many species of tree, both deciduous and evergreen, are susceptible to insect invasion that may result in bark falling off trees. Insect borers common to the Pacific Northwest include the Asian Longhorned Beetle and the Bronze Birch Borer. However, infested deciduous trees will most likely not lose their bark. Instead, noticeable holes and sawdust will be observed near the base of the tree trunk. Western Pine Beetles, on the other hand, will cause the bark to loosen and fall from the trunk. Coulter and Ponderosa pines are especially vulnerable to Western Pine Beetle infestation. Trails, or galleries, on the exposed layer of the trunk house the insect’s eggs and are a sure sign of infestation. If you see signs of these invaders, don’t waste time—call the professionals at Mr. Tree for a free consultation. If you suspect that bark falling off your trees is a cause for concern, the best course of action is to get a professional assessment. Our professional arborists can identify the cause, offer suggestions for improving the health of your trees, and provide solutions for saving your trees whenever possible.